Update 12/27/12 - I'm excited to report a successful test of Alex's two-wheel 4XS children's skate prototype! After 90 minutes of instruction, my 9-year-old beginner was able to control his speed on a slight downhill slope and stop at a chalk line. More details here. ...ever since I learned how it feels to be safe and in control through mastery of the heel brake. 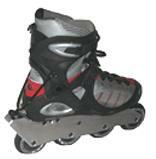 For the recreational skating majority, the combination of solid braking skills and a heel-mounted stopper delivers the shortest possible stopping distances. Brake-free skaters are willing to compromise: the T-stop requires better balance, using slaloms turns and the "slow plow" require new skills and longer stopping distances, and Power Slide variations take considerable skill and practice to achieve an effective stop. That's why my focus has always been on teaching the right way to make the heel brake work and suggest my students reinforce it through 100 practice stops. Who wouldn't want a brake with so many benefits to so many people? Pre-test, I found the inventor's claims literally incredible, but once I had the prototypes on my feet, it didn't take long to prove that this system truly does result in shorter stopping distances, and so much more. This photo shows the actual skate I tested, a soft boot recreational model with a slim wishbone-shaped cuff attachment that could someday be hidden within the heel cup. My first goal was to test the brake’s stopping effectiveness at speed and with gravity. But first I needed to set some baselines with my own standard-brake skates. I chose two Rollerblade models. I love to instruct in my Twisters, which are actually designed for maneuverability and support for skating through cones courses. My Lightenings are a delight for long and fast rolls on the local bike path. Since the Twisters boot and high cuff is made of sturdy plastic, I could really dig in and burn rubber. On my neighborhood hill, I measured several stops in these skates, using chalk to mark both the start and stopping points. My average for six ever-faster runs toward a marked line was 23 feet. Next I established distances on my Lightening speedskates. Due to the extra tall wheels and the loss of leverage that brings, braking was less effective than the Twisters. My best attempts on the Lightenings yielded an average stopping distance of 30 feet. These baseline tests by my highly qualified, brake-obsessed self showed the best-possible results from two pairs of skates designed for two very different uses. Finally, I strapped on Alex's Salomons with the 4XS prototype brake installed on the right skate (production version is expected to be more streamlined than current photos). Within seconds of standing, I experienced how easy it was to get friction by sliding my toe forward. Before beginning the actual tests, though, I first had to un-learn my instinctive toe-up habit. Every time I did that with my dream brake, I just kept on rolling! My first few stops on the test course were tentative, because I just didn't feel comfortable without a nice, fat rubber stopper to drag. Even so, each successful stop felt like a gradual and and controlled deceleration over a short distance. As soon as I had enough trust to jam my right toe forward at the higher speeds of my other tests, my distances settled into an average of 16 feet. Compared with the 23-foot average for the Twisters and the 30-foot average for the Lightenings, achieving consistent 16-foot stopping distances proves the 4XS technology is a major "brake-through" for the sport of inline skating and achieves the claimed 50% reduction! Satisfied with effectiveness, I began testing the DXS ease of use with postures typical of many beginners: straight legs, bent forward at the waist, wide feet. Even with stances where raising the toe was next to impossible--for example with both feet equally weighted--I felt a satisfactory degree of braking when sliding the right foot just a few inches forward, which to me is a key safety benefit. I was able to adjust a dial and found that friction could begin at just a half boot length forward if the skater needed that degree of control, or further out if not. All this convinced me that beginning skaters could learn how to brake and gain skating confidence with the 4XS system much easier than the stopping technologies available today. Next, I checked speed control on a steep hill. Not only was the 4XS brake easy to engage and disengage, but it was surprisingly quiet and smooth; I didn’t have a chunk of rubber vibrating over the asphalt surface. And that revealed another safety benefit: no more little rocks getting scooped up and wedged between the brake and back wheel, bringing it to an unexpected dead stop! My last tests were to check for hindrances to regular skating moves. I skied down my neighborhood hill with hard-carving slalom turns, tipping both outside and inside wheel edges onto the pavement. I did crossovers and swizzles, I skated backwards and forwards, I sprinted and coasted. All “without a brake!” At least that’s what it looked like, so even folks who think heel brakes look uncool could get into this. I am doing my best to encourage the inline industry to launch this next-generation braking system because I strongly believe it is the natural next step for the technology and growth of inline skating. To that end, I have prepared this list of benefits to skaters, instructors and the industry. I met inventor Alex Bellehumeur a week after our first conversation. That was a long telephone discussion where he convinced me that he and his new braking system were the real deal. He contacted me because he is just as passionate about expanding the market and safety of inline skating as I am. Alex was co-founder of SpeedHockey(TM) and Roller Hockey International (RHI), and inventor of the JOFA Speed Puck(TM). He currently holds nearly 20 patents. "...consistent 16-foot stopping distances [compared to 23 and 30] proves the 4XS technology is a major 'brake-through' for the sport of inline skating!"